June 30, 1920, W. S. Johnson, Treasurer (Charleston: Tribune Printing Co., 1920), pp. 9-10. The final adjudication by the Supreme Court of the United States of the controversy between the Commonwealth of Virginia and this State, commonly known as the Virginia Debt question, while not altogether satisfactory to the citizens and tax-payers of this State, was accepted with a feeling of relief. The decision of the Supreme Court and the later act of our Legislature definitely determines the amount and terms of payment. In discussing this important subject, I feel that it is proper for me to give the citizens and taxpayers a brief explanation and history of the Case from the beginning up to the present time. After going through voluminous records of the Case and reading long speeches and articles bearing upon the origin and the proceedings had in connection therewith, I find that the plainest and most concise statement of the facts in connection with the same is given in speeches delivered by the Honorable W. E. Wells of Newell, West Virginia, a member of the Virginia Debt Commission, before the West Virginia Manufacturers Association at Huntington on January 16, 1919 and before the same body at Wheeling on January 30, 1920, both of which addresses, with the permission of Mr. Wells, I herewith quote in full. [in treasurer's report but not reproduced here] Preceding these addresses I am giving a synopsis of the decision of the Court and the steps taken by West Virginia in connection therewith. On June 14, 1915 the Court rendered a formal judgment in favor of Virginia against West Virginia for $4,215,622,28 and interest on same at 4% from January 1st, 1861 to 1891 and at 3% from January 1891 to July 1, 1915, making a total interest charge of $8,178,307.22 and a total of interest and principal on this date of $12,393,929.50. The Court further decreed that this amount should draw interest at 5% until paid. The total on January 1, 1919 was $14,562,867.16. 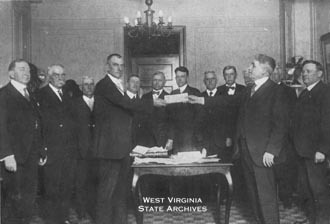 The West Virginia legislature at its regular 1919 session passed a law providing for the payment of this judgment as follows: $13,500,000.00, 20 year 3 1/2% bonds in favor of the Commonwealth of Virginia and a cash payment of $1,062,867.16. On April 18, 1919, Attorney General England and myself delivered to the Virginia Debt Commission the cash payment at the New Willard Hotel in the City of Washington, D. C. The above picture shows the Treasurer of West Virginia delivering to Hon. Wm. F. Rhea, Chairman Virginia Debt Commission, checks aggregating $1,062,869.16, the largest single payment ever made by this State in its history. On July 3, 1919, Secretary of State Houston G. Young, Auditor, J. S. Darst and myself, delivered to the Virginia Debt Commission at Richmond, $12,366,500.00 in bonds. The Remainder of the $13,5000,000.00 of bonds amounting to $1,133,500.00 was held in escrow by the State Board of Public Works pending the filing of the balance of the outstanding Virginia Debt certificates. The law provides that the interest on these bonds is to be paid semi-annually and that one twentieth of the principal is to be redeemed on the 1st day of January of each year for twenty years. On July 30th of this year, Colonel Joseph Button, Auditor of the Commonwealth of Virginia and Colonel Williams, both representing the Virginia Debt Commission, appeared before the Board of Public Works of this State and furnished satisfactory evidence that an additional number of Virginia Debt certificates had been filed with the Commission, amounting to $272,000.00 and in compliance with the provision of the West Virginia law providing for the payment of this debt, the Board of Public Works delivered to these gentlemen for the Virginia Debt Commission, $272,000.00 of the bonds held in escrow by the State Board of Public Works for this purpose.